A fire aboard a Sindhughosh-class submarine resulted in the death of two Indian sailors. The Indian navy’s INS Sindhuratna, a Sindhughosh-class diesel electric submarine, suffered a fire on Wednesday which resulted in the death of two officers serving on board and severe injuries to another seven sailors. Smoke on board the submarine triggered the automatic closure of hatches, resulting in the suffocation of the two sailors. The accident, which occurred about 74 kilometers off the Mumbai coast, marked the 10th major incident involving Indian naval hardware in the last seven months. Last year, the sinking of the INS Sindhurakshak resulted in the death of 18 sailors. Other accidents within the Indian navy include a fire aboard India’s INS Viraat, another Sindhughosh-class submarine running aground during low tide, and the amphibious vessel INS Airavat running aground, among others. The Indian Navy commissioned an inquiry into the accident aboard the INS Sindhuratna. “A high-level inquiry headed by an officer of rear admiral rank has been constituted and has immediately commenced its proceedings to establish the cause of all incidents and to recommend steps for continuing safe operations of submarines,” according to an official statement. The accident, combined with the other recent naval mishaps, prompted the resignation of India’s naval chief on Wednesday, almost immediately after the INS Sindhuratna incident became public. 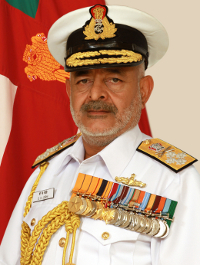 Admiral D. K. Joshi, India’s Chief of Naval Staff, resigned, taking “moral responsibility” for the incidents. According to The Times of India, Joshi was slated to serve until August 2015. Joshi’s decision to resign was met with praise across the Indian media. “Admiral Joshi’s immediate resignation taking moral responsibility for the accident stands out as a shining act of conscience in an age when our ministers cynically and shamelessly refuse to be held accountable for the deaths of countless citizens because of the negligence of their governments,” wrote The Times of India. Joshi’s resignation has been accepted with immediate effect and Vice Admiral R. K. Dhowan, the Vice Chief of Naval Staff, will take over as the Indian Navy’s temporary chief. Indian Defense Minister A. K. Antony has come under criticism from former naval officers for accepting Joshi’s resignation. Antony noted that Joshi appeared “disturbed” by the incident and consulted with Prime Minister Manmohan Singh before accepting his resignation. The INS Sindhuratna incident, combined with the sinking of the INS Sindhurakshak last year, have cast a shadow on the Indian navy’s efforts to modernize its current fleet. India is currently constructing the INS Vikrant, a 40,000 ton aircraft carrier, slated to enter service in 2017. The Sindhughosh-class diesel electric submarines were inaugurated in the late 1980s and are slated for replacement by Scorpene-class submarines in the near future.